What’s holding up TSA lines? It could be you. Don’t get me wrong. Canadians are lovely people. They generously gifted the world with Ryan Reynolds and Ryan Gosling. For that I am forever grateful. But there was one Canadian standing between me and my departure gate in a TSA security line who I was ready to throttle with a travel pillow. I impatiently rocked from foot to foot behind her as she shed her layers like an onion. A very slow onion. It appeared that Ms. Onion and I were about the same age, but by her actions, I suspected the last time she boarded an airplane was when “The Jeffersons” was the highest rated show on TV. Couldn’t she have removed at least a few of her layers in the 30 minutes we spent waiting to reach this critical point? This summer as you stand in a long, irritating security queue at the airport, think of Ms. Onion and her ilk. It’s time we look at another source of stagnant airport security lines — passengers. We’ve all dealt with them. There are travelers who are deathly slow, travelers who disregard rules, and travelers who flat out lack common sense in airports. The easiest way to avoid the tangle is to sign up for TSA PreCheck and Global Entry. If you haven’t, stop reading this and do it. When you sign up for Global Entry for $100, you automatically qualify for TSA PreCheck. For some reason you can just sign up for PreCheck if you prefer, for $85. I can now (in most cases) skip by the Disney World-worthy lines for domestic flights. 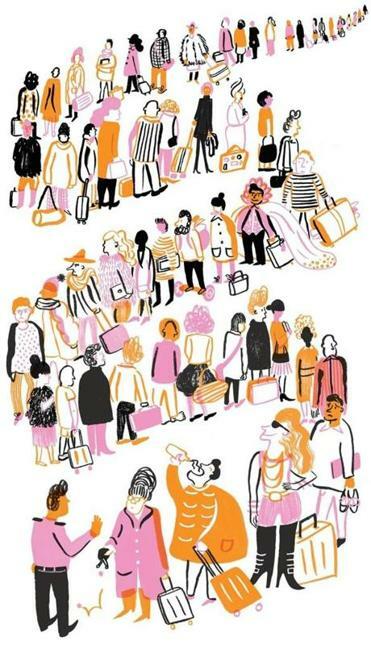 Travelers can help speed things along with these tips from Massport and the TSA. Sadly fewer passengers signed up for PreCheck and Global Entry than the TSA anticipated (about 2.7 for PreCheck as opposed to the anticipated 25 million). 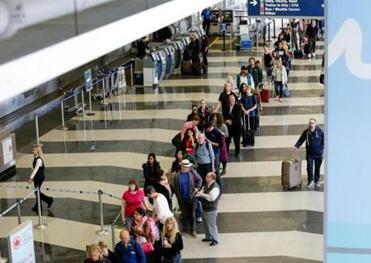 The number of people flying this summer is up, the number of TSA agents is down. People stuck in lines fit for Sisyphus have already missed flights across the country, and summer hasn’t even officially begun. If you don’t yet have TSA PreCheck, you can still make getting through security more efficient. Fortunately for you, I’m here to tell you how. First get to the airport early. Very early. Emotions are already running high when you travel, why throw another reason to be stressed onto this garbage pile of tension? There are apps and websites that can help you devise an itinerary of airport activities with food options, shopping, and terminal maps so you always have a clear idea of what to expect. My favorites are the slightly pricey iFly Pro and the free app Gate Guru. MiFlight and FlySmart are also essential. You’ll get through security faster (as will your fellow passengers) if you check your luggage and don’t bring a carry-on. I know I’m in the minority on this one, but I’m in favor of eliminating carry-ons. Keep in-flight essentials in a small personal bag, diaper bag, purse, or computer bag. If you bring a carry-on, test it to make sure its size is airline-approved. I know this sounds basic, but I’ve been stuck behind people who stubbornly held up the line by trying to sneak on larger bags. You will win no friends with this trick. Also, check to see what you can bring on board an airplane. You don’t want to wind up like Russell Crowe, who picked a fight with Virgin Australia on Twitter when he learned that he couldn’t bring his “Segway board” on the plane. I believe “Segway board” means “hoverboard” or “child’s toy that spontaneously combusts” in Crowe’s secret language. Try to keep your ID and boarding pass handy at all times, and when it’s not in use, keep it in a place you can access easily. That means not in the bottom of your purse under the Mentos and car keys. Also, don’t throw it in a bin as you go through security unless it’s in a personal bag. I’ve retrieved three passports just sitting in bins. You already know you’ll need to remove your shoes at the airport, so think wisely before you choose your footwear. Wear shoes that you can slip on and off in a minute or two. Why on earth would a woman wear riding boots to get on an airplane? Unless you’re going to be riding a horse while on the plane, they’re probably not necessary. Along with shoes that can easily be easily removed, please wear socks. This is for your comfort and for the comfort of those around you. I can barely look when I see someone walking barefoot through the body scanner. Have you thought about how many thousands of feet walked the same path before you? If you haven’t, you should, and then put some socks on because you’re really grossing everyone out. There’s no need for shoving or cutting as you move from security line to line. You have a seat on the airplane, take a breath and don’t be a jerk. Your seat isn’t going anywhere – unless you brazenly ignored my first piece of advice and got to the airport late. If that’s the case, you’ll earn enemies for life as you sweatily push yourself to the front of the line. As you approach the bins, start making like Gypsy Rose Lee and strip. Within reason, of course. You don’t want to wind up like Maggie McMuffin. I start by taking off my watch and my belt. I remove my cellphone and wallet from my pockets, and then I throw all of it in my backpack. I pull off my shoes and hold them in the other hand. I do all of this before I get to the conveyor belt and bins. I’m then able to drop my shoes in one bin, put my backpack on the conveyor belt, and take out my laptop. It takes two minutes. The problem is I’m usually then stuck waiting for the person in front of me to laboriously untie his shoes or shuffle the contents of his bags to and fro. He is then sent back through the line because he forgot to drop his coins in the doggy bowl. Unless you’re a direct descendent of Liberace, you don’t need to be wearing jewelry as you get on the plane. Leave it at home. Or, if you’re going on a fancy trip, put it in your carry-on or in your purse. The last thing you want to do is risk leaving valuables behind as you rush through security. When your bins come out of the X-ray, don’t act like you’re playing defense for the Celtics by blocking everyone’s access. Wait patiently. Let the people in front of you take their things before you push in. After you’ve retrieved your items, step out of the way and find a bench to put yourself back together, unless you have bare feet. If that’s the case put your shoes on as quickly as possible because I’m certain that the germs gathered by someone walking barefoot at the airport will one day start a zombie apocalypse. If you’re not a seasoned airport pro, practice all of this at home. Time yourself taking your shoes off and on. Perhaps buy a TSA-friendly computer bag, and study the layout of the airport you’ll be departing from so you can figure out where to have a nice leisurely meal before you depart. Or, do what you should have done years ago and sign up for TSA PreCheck and Global Entry. Your fellow travelers thank you in advance for your cooperation. Christopher Muther can be reached at muther@globe.com. Follow him on Twitter @Chris_Muther and on Instagram @Chris_Muther.